FETUS: ‘Heathers’ on TV. It’s kind of like teen suicide. DON’T DO IT. 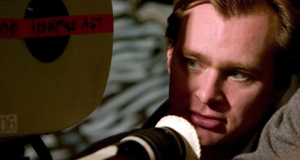 Christopher Nolan – looking awfully intense. Chris has a pretty damn good track record with me. Of course, my first encounter with him was Memento which was mind-blowing for us all. Then, I had the fortune of discovering his film school shorts in a Criterion collection while attending film school in jolly old England and found Doodlebug – his early mind-teasing product of genius. Look it up if you haven’t seen it yet. So I’m not too surprised to see that the teaser-trailer for his next movie, Inception, is just as intriguing. Haven’t found an embed-able one yet so check it out on Yahoo trailers here. While I have only a slight idea on what the storyline is, it SO gives me enough that I want to see it. The only synopsis on IMDB is this: A CEO-type becomes involved in a blackmailing scandal. It does have an amazing cast, as expected, including our dear Joseph Gordon-Levitt, Leonardo DiCaprio, Ellen Page, Marion Cotillard, Cillian Murphy and Michael Caine. Oh I’m all excited now. Chris is making his way into my director hall of fame.